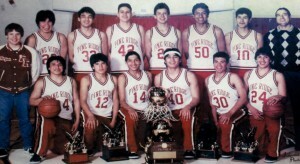 The Pine Ridge High School Thorpes made one of the most spectacular comebacks in the history of state championship games in South Dakota when they defeated Lennox in the finals of the 1987 Class A tournament. With time expiring in the third quarter, Lennox led by 13 points. The Thorpes rallied and won by seven, 60-53. Pine Ridge finished with a perfect 26-0 record and because of its impressive achievements is being recognized as the Team of Excellence for 2017 by the South Dakota High School Basketball Hall of Fame. The Thorpes and Coach Jesse Mendoza were saluted during the eighth annual Hall of Fame induction banquet March 25 at the Ramkota Hotel in Sioux Falls. Inducted during the banquet were 13 former standouts. The Thorpes were, from left, front, Ron Martin, Jeff Big Crow, Jon Garnier, Jim Colhoff, Joe Mesteth, Don Garnier. 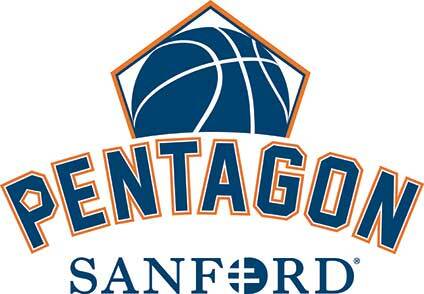 Back, Bart Ecoffey, Tony Brewer, George Bettelyoun, Bryan Brewer, Brent Brewer, Willie White, Paul Cedar Face and Mendoza.